Mentor undergraduate students in a research experience through the Fulton Undergraduate Research Initiative (FURI, pronounced like “fury”). You can mentor up to five FURI students each semester and receive $500 per student that completes FURI requirements. Encourage students to apply for Spring 2019. Applications are due by noon on Thursday, October 11, 2018. Faculty Mentors may submit their Faculty Mentor Support Letter by noon on Thursday, October 12, 2018. FURI students can assist on your current research project, or you can mentor them as they explore their own research idea. Complete student applications include a Faculty Mentor Proposal Support Letter. Fulton Schools undergraduate students are eligible for up to two semesters of FURI funding throughout their time at ASU. Questions? 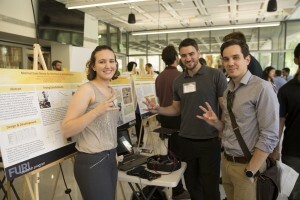 Contact Cortney Loui, coordinator, at furi@asu.edu, or check out the FURI web site.